Posted on July 2, 2017 at 6:16 pm. You’re in Traverse City for the week, or maybe for a few days, to enjoy the annual National Cherry Festival. You’re enjoying the air shows, outdoor concerts, festival activities, sunny days on the beach, downtown shopping, Open Space hanging…and cherries. Lots of fresh cherries. Escape the crowds (for a little while) and get into the woods on the Vasa Pathway. This is my most favorite Traverse City trail system, partly because of its convenient location near our house, but also because it offers numerous loops, both single track and a wider pathway—all nestled within the Pere Marquette State Forest. There are some fairly flat portions, but it generally is fairly hilly. Expect a satisfying, challenging workout. I start from my house and hook onto the path a mile away, near Timber Ridge Campground. (You can get onto the Vasa from this campground, too). There’s ample parking at the trailhead off Bartlett Road. This is a pet-friendly trail, too. At the trailhead you’ll find bathroom facilities and a drinking fountain to fill up your water bottle (there’s even a water dish for dogs). Trailhead: 4450 Bartlett Road, off Bunker Hill Road in Acme. Directions: From Traverse City, head east about 6 miles to the intersection of Bunker Hill Road and U.S. 31 North in Acme. There’s a stop light here. Turn right up the hill and go a few miles, around the big curve to the left, and Bartlett Road is on your right. You’ll see a brown Vasa sign on your right where Bartlett Road meets Bunker Hill. Follow Bartlett Road until you see the sign on your left for the trailhead, about a mile down. Distances: 3K, 5K, 10K, 25K loops. I love running the 5K loop, tacking it onto my regular out-and-back route of my house to the trailhead (8 miles total), when I want to log a longer run. Terrain: Fairly hilly. Some portions especially so. Bring a hand-held water bottle and fuel, particularly for longer distances. Embrace the morning—and the quiet—on downtown streets and on the TART Trail. During the day, downtown Traverse City—and the Midway rides, shown here—is one busy place during the Cherry Festival. But in the morning? You’ll find a beautifully quiet area to run. Emma and I ran this section a couple of summers ago. /Photo by Beth Price of Beth Price Photography. 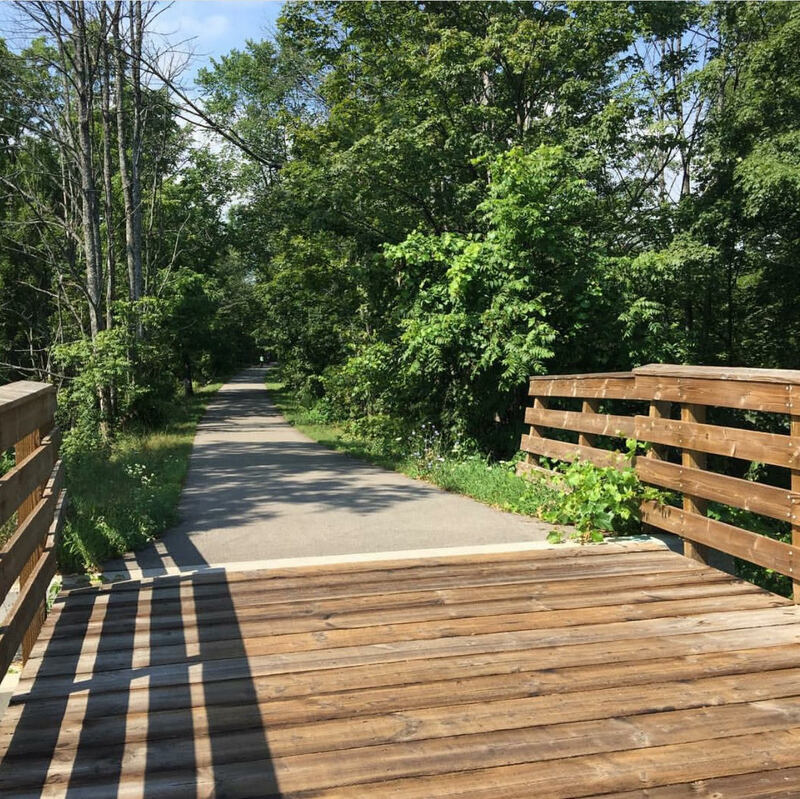 If you’re looking for a paved trail experience right here in Traverse City, the TART Trail is for you. This is a 10.5-mile “urban transportation corridor” with an eastern end point of M-72 (Bates Road) in Acme Township and a western end point at the M-22/M-72 intersection in Traverse City. It’s flat and easy to navigate—I’ve logged many longer runs along this path that treats you to views of both East and West Grand Traverse Bays, through downtown and neighborhoods, and the Mitchell Creek watershed. Getting There: Are you staying at a hotel or resort, maybe camping at Traverse City State Park? The TART Trail runs parallel to U.S. 31 North, the main highway connecting the east and west sides of Traverse City. To access the trail from one of the many lodging options along this highway, you’ll need to cross the road (if you’re staying along the Bay) and look for signage. Parking lots are located at Bunker Hill, Four Mile and Three Mile roads. You can also hop on the trail at spots such as the public library, at Woodmere Road, downtown by the Open Space, and at the grocery store Tom’s West Bay, where the highway meets M-72. Check out maps at traversetrails.org for detailed information. Distance: The eastern trail section from M-72 to Lautner Road is 2 miles, and then the trail leapfrogs to Bunker Hill Road and continues for 8.4 miles into Traverse City. At its western end the TART trail connects to the Leelanau Trail, which runs north to Suttons Bay. During my first marathon training I discovered I could start at my house, get onto the TART about a mile and half away at the Walgreen’s by our neighborhood, head clear across town and come back home for a total of 17 miles. Pretty much entirely on this path. (There are lots of shorter distances you can do, of course. This was marathon training, after all.) A favorite 4-5 miles: Start at the library on Woodmere, head north toward the water, travel along West Bay and through downtown’s Clinch Park on West Bay, and turn around at the 2 or 2.5-mile mark. Places to Eat & Drink: Lots of options here if you’ve run and are looking for post-workout fuel. It really all depends upon where you’re getting on the path. If you’re finishing downtown, there’s of course the Open Space, filled with local vendors this week for the Festival. A cup of cherries just might be what you’re craving—cherries are in fact a great recovery food! If you’ve started and finished at the library, check out Morsels, 321 E. Front St. on the east end of downtown, several blocks north from the library. Or try Oryana Natural Food Market‘s Lake Street Cafe (newly renovated and expanded! ), 260 E. Tenth St. that’s within walking distance of the library on Boardman Lake. Looking for the most delicious flatbread pizza and a pint of handcrafted Michigan brew? Check out The Filling Station, next to the Traverse Area Distric Library and overlooking Boardman Lake. (Read more about running + post-run noshing at The Filling Station in this article here.) Also nearby is Brewery Ferment, a small, friendly and locally-owned brewery with delicious brew on tap. (Full disclosure: my brother is co-founder and head brewmaster. He and my sister Kirsten operate the brewery in Old Town. Tell them I said hello if you stop in!) Grand Traverse Pie Company and Brew Coffeehouse and Cafe, both on Front Street in the heart of downtown, are two other favorite spots of mine. Venture into wine country on the Leelanau Trail. 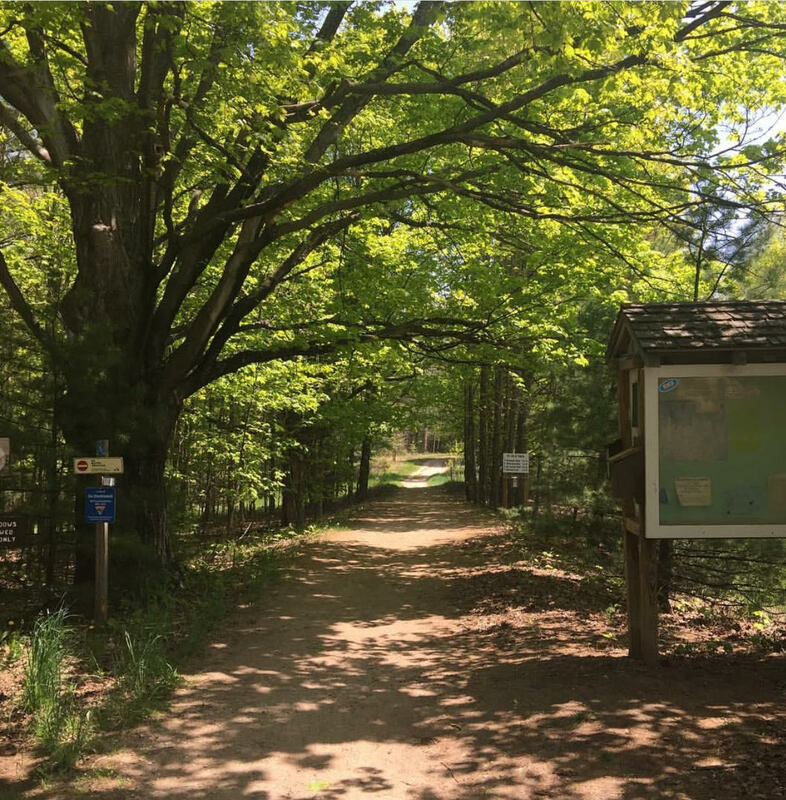 The 17-mile Leelanau Trail, owned and maintained by TART trails, provides a paved off-road connection between Traverse City and Suttons Bay. Running through the last of Leelanau County’s former railroad corridors, the Leelanau Trail features picturesque forests, farms, vineyards, lakes and ponds. Getting Started: There are three trailheads for parking along the trail at Cherry Bend Road, Fouch Road, and 4th Street in Suttons Bay. There is also parking available at the Leelanau Studios parking lot, just 1/3 mile east of the Cherry Bend Road trailhead. (Keswick Methodist Church, on Center Highway between Fort and Revold roads, welcomes trail users to use their lot. Extra Fun Stuff: A bike-and-ride option is available, thanks to a collaboration between TART and Bay Area Transportation Authority. Click Here to learn more about how you can explore Traverse City and Suttons Bay in comfort and convenience. Also: Grand Traverse Edible Trails created two food forests along the trail. The food forests are about two miles northwest of Traverse City: the Cedar Creek Food Forest is across from the Orchard Creek apartments next to Realeyes Homestead, and the DeYoung Forest Garden is at the Leelanau Conservancy’s DeYoung Farm and Natural Area. For more information on edible trails click here. Distances: I usually start from downtown Traverse City, maybe after a Pilates workout at Pure Pilates on Maple Street, but with parking a bit more, ahem, congested this festival week, I’d suggest either heading out from wherever you’re staying in the city (to make for a longer run) or drive to one of the trailheads and go from there. Check the maps at the trailheads to determine your out-and-back route—with the trail being 17 miles long, you really can pick your ideal distance, whether short or long. Soak up the water views on Old Mission Peninsula. Must-run road on Old Mission Peninsula: Bluff Road. Gorgeous views! /Photo by Beth Price of Beth Price Photography. Want even more water views throughout your run? Start at the base of Old Mission Peninsula and head out East Shore Drive, also known as the beginning of well-known local races the Bayshore and this coming Saturday’s Cherry Festival 15K, 10K and 5K (the half marathon starts on Old Mission Peninsula, at Chateau Grand Traverse). I’ve gotten to know this route extremely well training for Bayshore over the years. The first four miles of this route take you right along the water—head out early to catch the breathtaking sunrise. If you’re feeling especially ambitious, take a left onto McKinley (Mt. McKinley as it’s called during the 15K) and go up, up, up before crossing Center Road and going down a steep decline to Bayshore Drive—you could head back toward town along this road, catching views of West Grand Traverse Bay. Option #2: Check out the west side of the peninsula — start at Bryant Park, at the base of the peninsula — and follow Peninsula Drive for a picturesque out-and-back. Yet another option: drive out to the tip of the peninsula and park at the lighthouse, Mission Point Lighthouse. Explore the beautiful trail system here; trail signage outline varying mileage options. 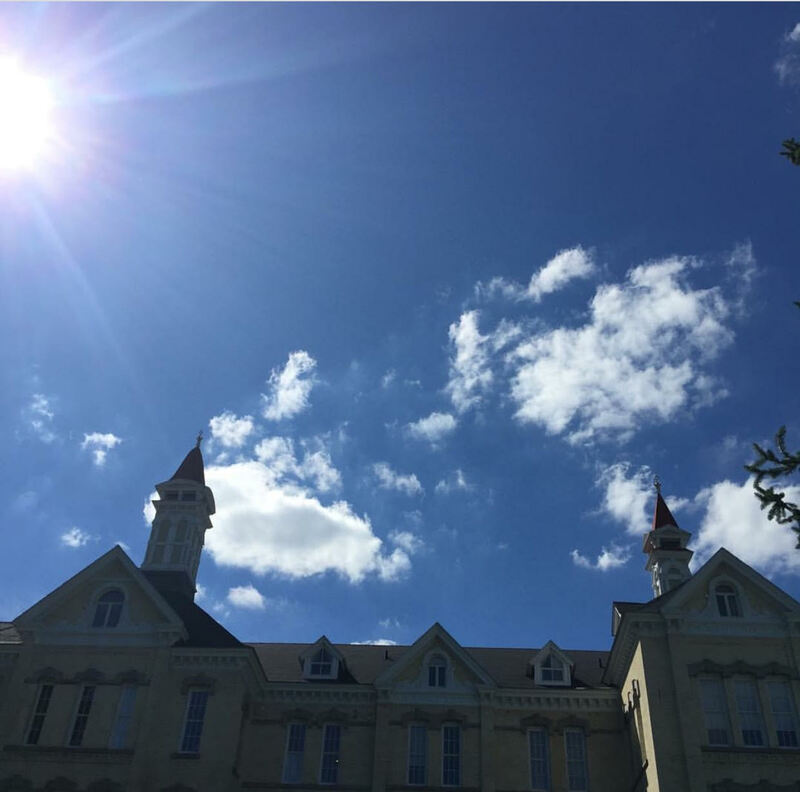 Getting Started: Park and start at Northwestern Michigan College or adjacent TC Central High School. Lots of parking at either spot during the summer. For Option #2 (the west side of the peninsula), park at Bryant Park, 1245 Peninsula Drive. Bonus: at the end of your run, jump into West Bay to cool off and get a great view to the west of the marina and downtown Traverse City. Sunsets here are spectacular, too. Distances: Get started on Eastern Avenue (this is the street the high school is on). Head out a couple of miles on East Shore and turn around for a flat 4-miler, or go all the way to the end of East Shore and back for about 8 miles. Center Road is a busy stretch—this is the main road for Old Mission Peninsula traffic, and vehicles whiz by—so be careful if you decide to go further. It’s another couple of miles along Center until it meets Bluff Road, on your right. Bluff is another beautiful stretch for running (and biking—you’ll likely cross paths with plenty of friendly cyclists on the peninsula). Experience an urban + scenic run at the Commons. The Village at Grand Traverse Commons. This area is one of my most favorite places in northern Michigan, not just for its delicious offerings and ultra-cool vibe (the area, once a state asylum, is home to independent businesses like coffee shops, eateries, restaurants, clothing boutiques, art galleries, a yoga studio, professional offices AND hip residential spots), but its impressive trail system. These 480 acres of preserved parkland are the perfect place to lose yourself in a run. Getting There: I usually park in front of Building 50 on the Grand Traverse Commons grounds. This is where Cuppa Joe, a popular coffeehouse, is located, as well as where my favorite yoga studio Yoga for Health and other businesses are housed. Parking is free in this area, and you’ll find spots in the circular drive out front or along the road leading up to the building. I’ve also parked in the nearby lot to the south, which is closer to Trattoria Stella, an amazing Traverse City restaurant, and also in the lot in front of Left Foot Charley, my favorite wine bar. Where to Run: You could run a hundred different ways, there’s that many twists and turns to these paths. I like to start at Cuppa Joe, since that’s where I like to end up, for their yummy lattes. A paved path on the east side of the building will take you to a parking lot that directly connects to the trail system. This is where I hook up to the paths usually, and I follow it for a mile to the foot of an especially steep hill. Usually I am feeling up to tackling this hill, though there are times when I opt to go left or right instead and follow a different route. I like to follow a route that takes me to another trailhead along a gravel road at the south end of the Commons area. Here, you’ll come face-to-face with majestic white barns. From there, I head right and follow the gravel road which not too long ago became connected to a new paved thoroughfare/boulevard connecting W. Silver Lake Road to the Commons. If you follow this around back toward where you started, you’ll see a two-track to your right that provides more trail running, including a couple of half-mile stretches. One takes you through a tunnel of pine trees while another weaves through a wooded area with a bubbling brook just across the street from the Grand Traverse Pavilions. At this point, you’re at about 4 miles. To run an even 5, keep running north, toward Front Street, before looping back around behind Munson Hospital, Higher Grounds Coffee, Left Foot Charley, Spanglish (oh, the tacos…) and finally back to Building 50 and Cuppa Joe. Check out this printable map of the trail system. Post-run fuel: Cuppa Joe has fantastic lattes (caramel soy being my top choice), as does Higher Grounds, which is located next to Left Foot Charley. A couple of newer spots worth checking out: Earthen Ales for craft brew and Sugar 2 Salt, known for amazing breakfast. If you have extra time to explore, definitely check out the numerous other shops and eateries located within the Village. 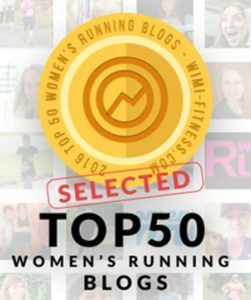 There are so many other awesome places to run in and around Traverse City … What did I miss? What is your favorite Traverse City running route?